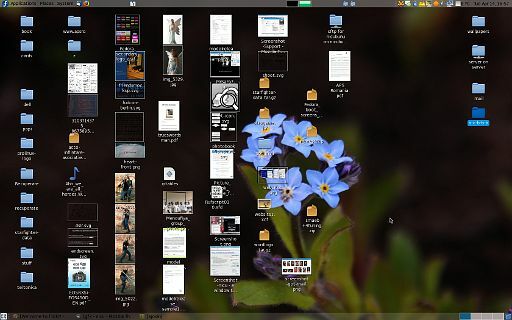 nicu's FOSS'n'stuff: A messy desktop? The past day when blogging about the new Leonidas backgrounds, Martin apologised for his messy desktop, which made me think: if that's messy, then how I should call my desktop? PS: and this is after I did some cleaning the past week, when wiped F10 and installed F11 Beta. I use the solution: just put everything in your home directory. I could use a script that could move everything from Desktop into the home directory when the files sat too much time on the Desktop. To me, the difference is that the home directory has a scrollbar, and the destkop doesn't.